Aerovironment, which helped launch the EV era as the factory-preferred charging station for the 2011 Nissan Leaf, will help usher in a new era in battery electric vehicles as official home charging station supplier for the 2017 Chevrolet Bolt. The Bolt, which launches in California and Oregon and ultimately will be sold in all 50 states, is considered a game-changer in the BEV segment. It is the first of an anticipated crop of sub-$50,000 electric cars that will deliver 200 miles or more range per charge. The $37,495 (base price) Bolt is EPA-rated at 238 miles per charge. To date, most EVs run dry at 100 miles of range or less; only Tesla Model S and Model X EVs, which start at around $70,000, have broken the 200-mile mark. 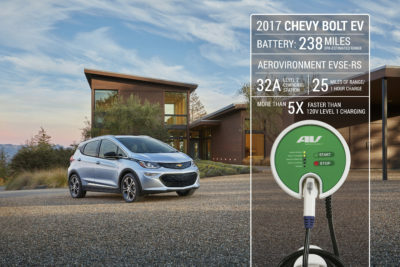 California-based Aerovironment said a new 32-amp EVSE-RS home charger, a 240-volt, Level 2 device, will be sold to Bolt customers through Chevrolet dealers. The station, which can be financed along with the car, hasn’t been priced yet, but Aerovironment sells similar RS model home stations, rated at 30 amps, for $500 to $750, exclusive of installation. The 32-amp Bolt station supplies power at a slightly faster rate than the 30-amp stations. Publicity photo shows Aerovironment’s home charging station for Chevy Bolt. For the uninitiated, TheGreenCarGuy walks you through the intricacies of EV charging and charging stations in our article on plug-in vehicle charging; amperage and other electrical terms related to plug-in vehicle charging are explained in a companion “Amps, Volts and Watts” article. Because the Bolt is equipped with a 7.2-kiloWatt charger, the Aerovironment station can supply power at a rate that can restore about 25 miles of range per hour. That means the Bolt’s 60 kiloWatt-hour battery pack can be fully recharged in about 8.5 hours on a properly sized Level 2 home or commercial charging station, and can achieve an 80 percent recharge in under an hour on a Level 3 fast charger. In addition to its work with Nissan and Chevrolet, Aerovironment has been the factory-preferred supplier for home stations for Ford, Hyundai, Kia, Fiat and Mitsubishi plug-in vehicles. The company makes home and commercial charging systems that are compatible with all EV models.